"Demo in Austin 2018 1"
Back to my usual mode of teaching. This is my first demonstration on my Austin workshop. Low key, and bright center of focus. You have seen too many of my demos like this. Please be patient with me. Life is keep on going. "Copper Kettle and Green Apple"
I am happy to see my color scheme change in paintings. I use to use value dominantly to create the drama for my art. Now I tend to establish dominant color tones for my paintings. I get more chances using higher chroma colors in large areas. I am in the transition from a tonalist to a colorist. Can you believe I did not use ultramarine blue in this painting? This one is harmonized to yellow. This one I harmonize the color to blue. The reason I painted this one is that I want to explore the world of color in a sense of design. I deliberately deviated from the color accuracy of realistic landscape. I want to compose the colors of this painting as a piece of music. The painting has a strong dominated color tone, which is green. All the colors are far away from real scene. All the colors on the painting are artificial. But I kept the color relationships. By varying the temperature of all the greens, I presented the depth and local colors of the trees, houses, and hills. We all know green is a difficult color to use. My old trick was to indicate greens without using green. However this time I deliberately using a lot of pure green, but I don't want the greens look garish. I hope to create a strong sense of color harmony. I sent this painting to this year's Oil Painters of America National Exhibition. I am very happy to know that this painting has been sold on the show. Since my nowadays major art activity is teaching workshops, I have not spent enough time and effort in improving my own art. So please be patient with me. I feel this kind of situation will still last for a few more years. I will try my best to bring my best work to the shows, but you may not see much of progress. I can only grow in baby steps. I am very happy to announce another invited artist workshop. 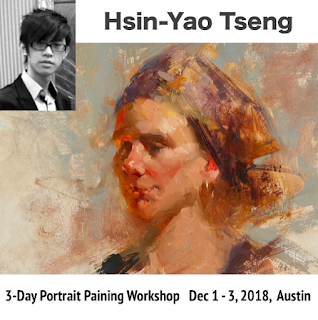 In early December, Hsin-Yao Tseng will come to Austin and teach a 3-Day portrait painting workshop. Hsin-Yao and I met in the summer of 2012 in San Francisco. At that time, he had just graduated from the Academy of Art University. In these a few years, this young man has been a rising star in the world of representational art. He has shows and in magazines all over the places. I am very happy he will come to Austin to shows his techniques in portrait painting. You may check: Hsin-Yao Tseng's workshop in Austin for more information, and sign up.